Miya Folick’s operatic synth-pop is something to be cherished in this cold, dark world. Her 2018 debut album Premonitions displayed her otherworldly vocal talent, emotionally nuanced songwriting and contagious compassion. The Los Angeles-based singer/songwriter made the trip over to Austin, Texas for SXSW 2019, where she played a number of shows including a Saturday afternoon set at Cheer Up Charlies and a stripped down session for Paste at the Riverview Bungalow. With her music, Folick doesn’t just want us to feel better, she wants us to be better. Adorned with hauntingly beautiful vocal loops and majestic keyboards, “Thingamajig” was one of the most impactful moments of her Cheer Up Charlies set. In an impromptu spoken word interlude, she expressed having a type of impostor syndrome—that she wasn’t good enough, that she didn’t deserve to be there and that she doesn’t know what she’s doing. The song encourages us to stop pointing the finger at ourselves when we should blame power structures instead for their perpetuation of personal inadequacy. Lyrically, Folick rarely stays on the same talking point. Though there are undeniable moments of poignancy and catharsis, they’re often squished between spunkier, light-hearted numbers like “Cost Your Love,” which sparked a joyous sway from the Cheer Up audience. Older tracks like “Give It To Me” and “Deadbody” are the kind of throaty howlers that drew vocal comparisons to Sharon Van Etten and Dolores O’Riordan, and those two songs garnered frequent whoops from the audience in sheer admiration of her barbed wire vocals. It’s a mystical force of nature that just makes you want to shut up and let it wash over you. Whether it’s the angelic upper registers of her voice or the punk-ish battle cries, Folick never loses the audience’s utmost attention. You could see the immediate raving amongst the audience after her goosebump-inducing set, and it makes me wonder how much longer she’s going to be playing intimate venues like this one. 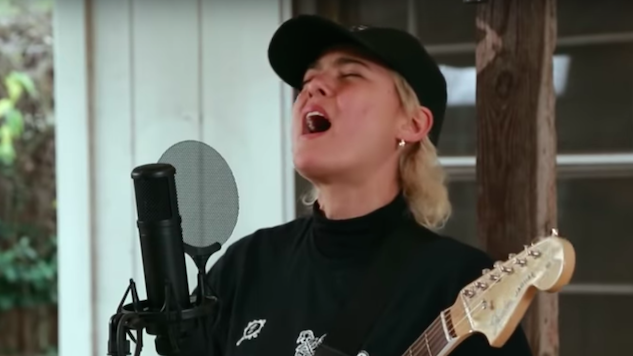 Watch Miya Folick’s full Paste session from SXSW in Austin, Texas below. Revisit our 2018 profile interview with Folick here.